This summer, we found 68 basal plants in the crossing experiment. None of these plants have ever flowered, but maybe next year! We measured plant status, number of rosettes, number of leaves, and length of the longest leaf of the individuals. We also noted damage (herbivory) to the leaves. These data will allow Amy to test how mating with individuals from other populations affects Echinacea fitness. She planted 15,491 achenes, the offspring of crosses from six of the largest remnant populations. 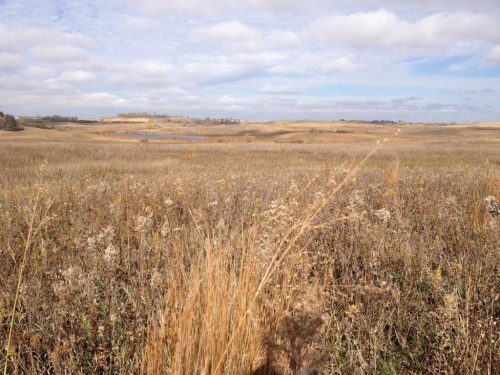 Populations might either benefit or suffer from crossing with plants from another population. Products: Read about Amy’s analysis of the interpopulation crossing experiment in her flog post. You can find more information about Amy’s experiment and links to previous flog posts regarding this experiment at the background page for the experiment. Inbreeding has negative effects on Echinacea, leading to reduced survival and fitness. In isolated populations, populations could benefit from genetic diversity introduced by mating with individuals from other populations (“outcrossing”). However, gene flow from other populations may compromise a population’s adaptation to its local environment. Amy Dykstra designed an experiment to test how mating with individuals from other populations affects Echinacea fitness. In the summer of 2008, Amy and Team Echinacea performed 259 crosses between individuals randomly selected from 6 of the largest remnant populations. That fall, Amy planted the offspring of these crosses (15,491 achenes) into an experimental plot at Hegg Lake WMA. Every summer, including 2016, we measure plant status, number of rosettes, number of leaves, and length of the longest leaf of the individuals in the plot. We also note damage (herbivory) to the leaves. Data collected: We collected plant fitness measurements (plant status, number of rosettes, number of leaves, and length of longest leaf) electronically. GPS points shot: We shot points at all surviving plants (and a few that we couldn’t find this year, but will check next year) in the experimental plot, which will make finding and monitoring these plants much more efficient in the future. The points are stored in ‘AMYSCROSSIG_20160712_SULU.tsj’ and some rechecks to those points are in “AMYSCROSSING_20160830_SULU.tsj’. Products: Read about Amy’s analysis of the interpopulation crossing experiment in her flog post from last summer. Today Brad and I finished the 2015 census on my crossing experiment plot. 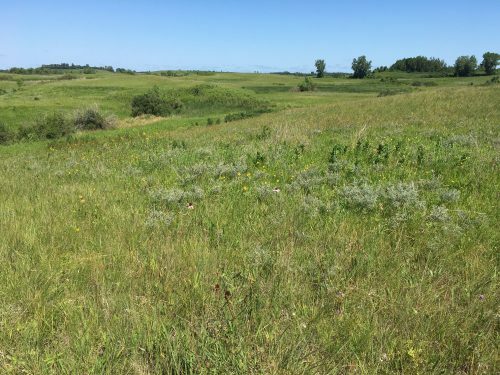 The plants in this plot are the offspring of within-population or between-population crosses of Echinacea plants from six nearby prairie remnants. 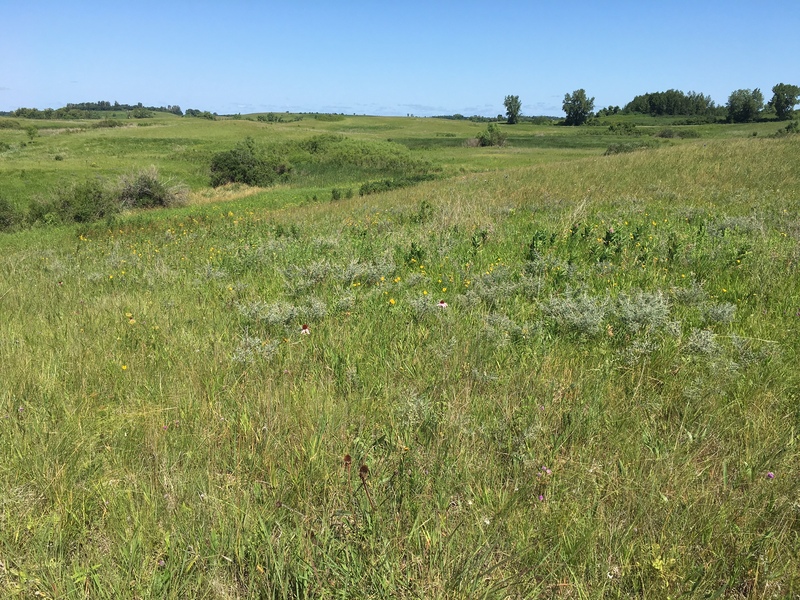 In most cases, the pollen for between-population crosses was supplied by the largest prairie remnant in the experiment, identified as SPP in the figure below. Crosses were made in the summer of 2008 (thanks to LOTS of help from Team Echinacea). We sowed a total of 15,491 achenes into this plot in the fall of 2008. We estimated that about 40% of the achenes contained embryos, based on their weights. In the spring of 2009, we found 396 seedlings. We found an additional 43 seedlings in late summer, 2009, and another 10 new seedlings in the summer of 2010. In 2011, we were only able to find 264 of these plants, and the numbers have continued to decline: we found 185 in 2012, 124 in 2013, 112 in 2014, and 89 this summer (2015). We have yet to observe any flowering! As you can see from the graph (based on results through 2011), results of within- and between-population crosses have been mixed. The columns in the graph represent estimated mean total leaf number for each cross, for a starting number of 25 achenes, based on an analysis of total fitness (using an aster model). 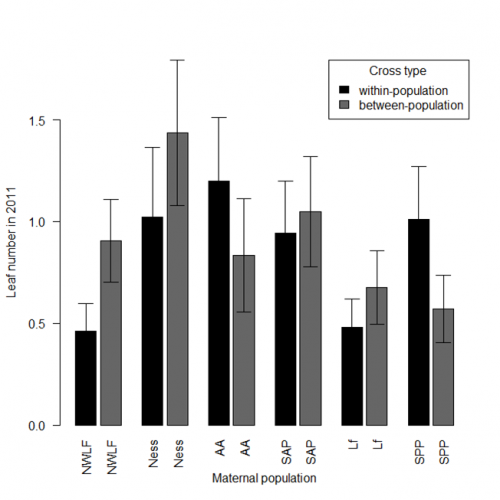 The main effect of cross type was non-significant; however, there was a significant effect of maternal population, and a statistically significant interaction between maternal population and cross type. In other words, the success of the type of cross depended on the maternal plants that were crossed. For the smallest population (identified as NWLF), offspring of between-population crosses outperformed within-population crosses. For the largest population (SPP), the within-population crosses performed better than the between-population crosses. What implications can we draw from these results? In some cases a small, inbred remnant population may be enhanced by cross-breeding with another local population (this is called “genetic rescue”). However, between-population crosses also run the risk of outbreeding depression, as we have observed for the SPP-Lf cross, compared to the SPP-SPP within-population cross. We now have 4 more years of data, with quite a bit of mortality. It will be exciting to perform another analysis including more data! The classic seedling search position. Larger seedling with a true leaf. We marked seedlings with colored toothpicks, so we can re-find them in August, and again next summer. I hope to be able to learn about initial seedling establishment as well as seedling survival through the first two seasons. Amy and I have been out at Hegg Lake since Tuesday afternoon, searching low and lower for Echinacea seedlings in my small “next generation genetic rescue” experiment and Amy’s crossing and local adaptation experiments. We’re finding quite a few seedlings- they’re mostly just cotyledons (some amazingly with their little seed coats still attached) and about a quarter have put out their first true, very fuzzy leaf. Without the true leaves, the seedlings can be tricky to tell apart from the seedlings of one or two other species, but we’ve developed a fairly good search image and are making notes of questionable identifications. I’ll also brag and mention that today I found the seedling with the longest true leaf so far at 42 mm. Looked to me like the plucky guy was flipping the bird. Ah, Amy and I certainly do succeed at keeping ourselves and each other entertained. We completed searches for my experiment on Tuesday, made it through the crossing experiment Wednesday and today and plan to finish up with the local adaptation experiment tomorrow. Photos are forthcoming.